There are some stories that seem as old as time itself and the timelessness of them means that they will always be retold on the silver screen. Most of the time the intent is to just action it up, so it’s refreshing to see someone take the Arthur legend and put a modern spin on it. For me I like to see a filmmaker’s take on a classic story and while there are some you don’t quite get ( talking to you 2018’s Robin Hood, you too 2010’s), others like King Arthur : Legend of the Sword are easier to get behind when they break the old mold. I figure somewhere there is a rule written where you have to have a certain number of King Arthur movies per decade, and to start 2019 we get one with kids, and oh, by the way, it’s good. Alex (Louis Ashbourne Serkis) is just a kid who is dealing with advancing a grade in school and coming to the realization that he and his friend Bedders (Dean Chaumoo) are now small fish in a very big pond. Now they are part of the food chain and of course that means bigger fish who come in the form of bullies in Kaye (Rhianna Dorris) and Lance (Tom Taylor) who make it a point to go after both Alex and Bedders. It is one day when Alex is running from them that he stumbles into a construction site where he finds a sword in a stone and he does what anyone would do in that circumstance, he pull it out. Of course it pulls free and when he and Bedders examine it they discover that it belongs to Arthur, the once and future King. 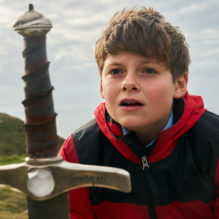 After having a laugh over it, they move on with their life until a new kid comes to school name Merlin (Angus Imrie) who tells Alex after removing the sword that he has been chosen and he must stop what is about to come. You see in four days Morgana (Rebecca Ferguson), Arthur’s half sister, is set to return and claim the sword and rule over mankind. In her way are a bunch of kids who with Arthur fight Morgana it hopes to stop her evil plan. I am sure your first thought is a lot like mine, do we really need a film that is a kid-version of King Arthur? Well if it comes from writer-director Joe Cornish (Attack the Block) then the answer is always a yes. Keeping with the trend from last year, I think January is a better place with a happy and charming British film like The Kid Who Would be King. The telling of this classic story is fun, with a little darkness peppered in, but mostly, it’s just so damn charming. It will be hard for you not to love Serkis’s take as the future King as well as his Knights of the Roundtable who are a joy to watch. Cornish delivers a film that you will want to show your kids as the story is filled with positive messages and plus you can never go wrong with learning good values as you are entertained. With the right combination of young talent and a sprinkle of Patrick Stewart, this is a welcome edition to the list of films that include Excalibur (also starring Patrick Stewart by the way), and The Sword in the Stone. I hope others are paying attention and they see there are ways to tell these old tales in new ways, because of Joe Cornish and a his team, I bow before the power of everyone’s favorite King.